If you’re an Amazon affiliate and you don’t already have a copy of ThirstyAffiliates Pro, you should definitely check it out. The Amazon Importing feature will change the way you use Amazon as an affiliate. If you’re reading this then it’s likely that you already own the ThirstyAffiliates Pro and want to know how to get your Amazon Access Key ID and Secret Key to make the thing work. You need these keys to give the plugin authority to communicate with Amazon on your behalf. They are necessary for the feature to work. If you have any questions about the Product Advertising API or problems with retrieving your Amazon Access Key/Secret Key please contact them directly as we cannot support you in this process beyond the guide we have below. Getting your Access Key ID and Secret Key pair is easy enough, but it involves a number of steps. Goto the Amazon Associates Program home page and login to your account. For the purposes of this tutorial, we assume you are already an approved Amazon affiliate. Click the button to access/signup. Log in with your Amazon login or follow the prompts to create your Product Advertising API account. If you get a prompt on the next screen, click on Continue to Security Credentials. 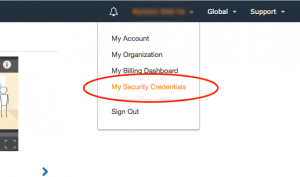 DO NOT USE IAM USERS – Amazon’s Product Advertising API must use the parent keys, not user keys. Expand the “Access Keys” section. This section contains all of your current access keys. You will likely need to make a new one (you can have 2 active key pairs per account). Feel free to use an existing one if you have the secret key already, otherwise click on the Create New Access Key button. A dialog box will appear with your new Access Key and Secret Key. Copy these into the ThirstyAffiliates->Settings page under the Amazon Importer settings tab. We also recommend clicking the Download Key File button and storing this in a secure location, like a password manager as you cannot retrieve the Secret Key from an existing Access Key after you click Close. Make sure you have it otherwise you will need to de-activate an old key and create another new one. Still having trouble getting your Access Key and Secret Key? Another alternative method of retrieving these (after you have signed up for the Product Advertising API as above and logged in) is to go to the AWS management console directly at https://aws.amazon.com. You need to retrieve the root access keys, not the user keys. This is because the Product Advertising API isn’t fully compatible with the AWS user management yet. © 2019 Rymera Web Co Pty Ltd. All Rights Reserved. ABN 51 604 474 213.